NEW PAPERS ! Normalization in real-time PCR - page 4 NEW PAPERS ! Data normalisation in real-time RT-PCR is a further major step in gene quantification analysis (Bustin 2002, Pfaffl 2001 ). The reliability of any relative RT-PCR experiment can be improved by including an invariant endogenous control (reference gene) in the assay to correct for sample to sample variations in RT-PCR efficiency and errors in sample quantification. A biologically meaningful reporting of target mRNA copy numbers requires accurate and relevant normalisation to some standard and is strongly recommended in quantitative RT-PCR. But the quality of normalized quantitative expression data cannot be better than the quality of the normalizer itself. Any variation in the normalizer will obscure real changes and produce artifactual changes (Bustin 2000). Real-time RT-PCR-specific errors in the quantification of mRNA transcripts are easily compounded with any variation in the amount of starting material between the samples, e.g. caused by sample-to-sample variation, variation in RNA integrity, RT efficiency differences and cDNA sample loading variation (Stahlberg 2003 2004a 2004b). This is especially relevant when the samples have been obtained from different individuals, different tissues and different time courses, and will result in the misinterpretation of the derived expression profile of the target genes. Therefore, normalisation of target gene expression levels must be performed to compensate intra- and inter-kinetic RT-PCR variations (sample-to-sample and run-to-run variations) (Pfaffl & Hageleit 2001). Data normalisation can be carried out against an endogenous unregulated reference gene transcript or against total cellular DNA or RNA content (molecules/g total ; DNA/RNA and concentrations/g total DNA/RNA). Normalisation according the total cellular RNA content is increasingly used, but little is known about the total RNA content of cells or even about the mRNA concentrations. The content per cell or per gram tissue may vary in different tissues in vivo, in cell culture (in vitro), between individuals and under different experimental conditions. Nevertheless, it has been shown that normalisation to total cellular RNA is the least unreliable method (Bustin 2000 Bustin 2002). It requires an accurate quantification of the isolated total RNA or mRNA fraction by optical density at 260 nm, using the Agilent Bioanalyser 2100, Experion (Bio-Rad), or Ribogreen RNA Quantification Kit. Alternatively the rRNA content has been proposed as an optimal and stable basis for normalisation, despite reservations concerning its expression levels, transcription by a different RNA polymerase and possible imbalances in rRNA and mRNA fractions between different samples (RNA and RT page). 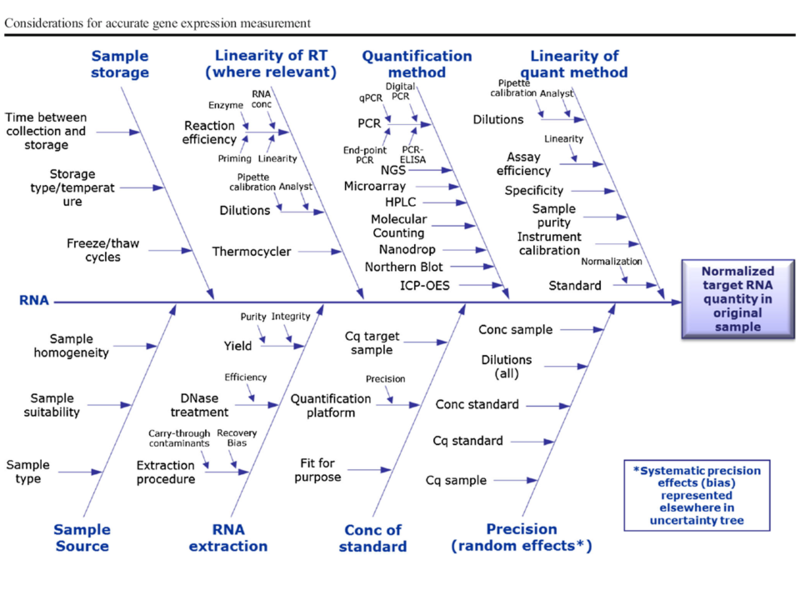 To normalize the absolute quantification according to a single reference gene, a second set of kinetic PCR reactions has to be performed for the invariant endogenous control (= expressed reference gene) on all experimental samples and the relative abundance values are calculated for internal control as well as for the target gene. For each target gene sample, the relative abundance value obtained is divided by the value derived from the control sequence in the corresponding target gene. The normalized values for different samples can then directly be compared (Pfaffl 2001 andmore papers on the relative expression sub-page). REST -- Relative Expression Software Tool - New software version available! Fluorescence-based quantitative real-time PCR (qRT-PCR) is a widely and commonly used technology to quantify DNA and RNA products. The main applications of qRT-PCR are diagnostic for rapid detection of nucleic acids characteristic of infectious diseases, cancer or genetic abnormalities and, when coupled with reverse transcription, it is mainly used to provide quantitative measurements of gene transcription. The validity and reproducibility of the results of qRT-PCR studies depend on numerous factors, including but not limited to, adequate reporting of experimental settings, choice of appropriate reference genes and statistical analysis of the data generated. This topical series is a collection of manuscripts relevant to researchers interested in normalization and validation of qRT-PCR experiments. 1. BestKeeper: Pfaffl MW, Tichopad A, Prgomet C, Neuvians TP. 2004. Determination of stable housekeeping genes, differentially regulated target genes and sample integrity: BestKeeper--Excel-based tool using pair-wise correlations. Biotechnology letters 26:509-515. 2. NormFinder: Andersen CL, Jensen JL, Orntoft TF. 2004. Normalization of real-time quantitative reverse transcription-PCR data: a model-based variance estimation approach to identify genes suited for normalization, applied to bladder and colon cancer data sets. Cancer research 64:5245-5250. 3. Genorm: Vandesompele J, De Preter K, Pattyn F, Poppe B, Van Roy N, De Paepe A, Speleman F. 2002. Accurate normalization of real-time quantitative RT-PCR data by geometric averaging of multiple internal control genes. Genome biology 3:RESEARCH0034. 4. The comparative delta-Ct method: Silver N, Best S, Jiang J, Thein SL. 2006. Selection of housekeeping genes for gene expression studies in human reticulocytes using real-time PCR. BMC molecular biology 7:33. NormFinder applets for MS Excel and "R"
Comparison of in vitro and in vivo reference genes for internal standardization of real-time PCR data. Gilsbach R, Kouta M, Bonisch H, Bruss M.
Institute of Pharmacology and Toxicology, University of Bonn, Bonn, Germany. Real-time PCR is a powerful technique for gene expression studies, which have become increasingly important in a large number of clinical and scientific fields. The significance of the obtained results strongly depends on the normalization of the data to compensate for differences between the samples. The most widely used approach is to use endogenous reference genes (housekeeping genes) as internal standards. This approach is controversially discussed in the literature because none of the reference genes is stably expressed throughout all biological samples. Therefore, candidate reference genes have to be validated for each experimental condition. In our studies, we introduced and evaluated an in vitro synthesized reference cRNA for internal standardization of relative messenger RNA (mRNA) expression patterns. This reference, consisting of the in vitro transcribed coding sequence of aequorin, a jellyfish protein, was incorporated in the extracted RNA. The experimental significance of this approach was representatively tested for the expression of the neurotrophin-3 mRNA in distinct regions of mouse brains. A comparison to three stably expressed reference genes [beta-actin, glyceraldehyde-3-phosphate dehydrogenase (GAPDH), and hypoxanthine phosphoribosyl-transferase 1 (HPRT1)] gave evidence that the spiking of template RNA with in vitro transcribed cRNA is a valuable tool for internal standardization of real-time PCR experiments. Today, quantitative real-time PCR is the method of choice for rapid and reliable quantification of mRNA transcription. However, for an exact comparison of mRNA transcription in different samples or tissues it is crucial to choose the appropriate reference gene. Recently glyceraldehyde 3-phosphate dehydrogenase and beta -actin have been used for that purpose. However, it has been reported that these genes as well as alternatives, like rRNA genes, are unsuitable references, because their transcription is significantly regulated in various experimental settings and variable in different tissues. Therefore, quantitative real-time PCR was used to determine the mRNA transcription profiles of 13 putative reference genes, comparing their transcription in 16 different tissues and in CCRF-HSB-2 cells stimulated with 12-O-tetradecanoylphorbol-13-acetate and ionomycin. Our results show that "Classical" reference genes are indeed unsuitable, whereas the RNA polymerase II gene was the gene with the most constant expression in different tissues and following stimulation in CCRF-HSB-2 cells. Real-time RT-PCR has become a common technique, no longer limited to specialist core facilities. It is in many cases the only method for measuring mRNA levels of vivo low copy number targets of interest for which alternative assays either do not exist or lack the required sensitivity. Benefits of this procedure over conventional methods for measuring RNA include its sensitivity, large dynamic range, the potential for high throughout as well as accurate quantification. To achieve this, however, appropriate normalisation strategies are required to control for experimental error introduced during the multistage process required to extract and process the RNA. There are many strategies that can be chosen; these include normalisation to sample size, total RNA and the popular practice of measuring an internal reference or housekeeping gene. However, these methods are frequently applied without appropriate validation. In this review we discuss the relative merits of different normalisation strategies and suggest a method of validation that will enable the measurement of biologically meaningful results. a new statistical method to normalize real-time RT-PCR data. Profiling studies using microarrays to measure messenger RNA (mRNA) expression frequently identify long lists of differentially expressed genes. Differential expression is often validated using real-time reverse transcription PCR (RT-PCR) assays. In conven-tional real-time RT-PCR assays, expression is normalized to a control, or housekeeping gene. However, no single housekeeping gene can be used for all studies. We used TaqMan® Low-Density Arrays, a medium-throughput method for real-time RT-PCR using microfluidics to simultaneously assay the expression of 96 genes in nine samples of chronic lymphocytic leukemia (CLL). We devel-oped a novel statistical method, based on linear mixed-effects models, to analyze the data. This method automatically identifies the genes whose expression does not vary significantly over the samples, allowing them to be used to normalize the remaining genes. We compared the normalized real-time RT-PCR values with results obtained from Affymetrix Hu133A GeneChip® oligonucleotide microarrays. We found that real-time RT-PCR using TaqMan Low-Density Arrays yielded reproducible measurements over seven or-ders of magnitude. Our model identified numerous genes that were expressed at nearly constant levels, including the housekeeping genes PGK1, GAPD, GUSB, TFRC, and 18S rRNA. After normalizing to the geometric mean of the unvarying genes, the correla-tion between real-time RT-PCR and microarrays was high for genes that were moderately expressed and varied across samples. Standardization strategy for quantitative PCR in human seminoma and normal testis. Housekeeping genes are commonly used as endogenous references in quantitative RT-PCR. Ideally these genes are constitutionallypure seminoma were obtained for RNA-extraction. Real-time RT-PCR was used to examine the mRNA-expression of ubiquitin C, beta-actin, GAPDH, 18S ribosomal RNA (18S rRNA) and porphobilinogen-deaminase (PBGD). Additionally, 3 normal testicular analyses. Ubiquitin C (protein degradation) was down-regulated, GAPDH (carbohydrate metabolism), beta-actin (cytoskeleton), 18S rRNA (ribosome) and PBGD (porphyrin metabolism) were up-regulated in seminoma. A normalization of the target gene data with up-regulated housekeeping genes would equalize or underestimate up-regulated data and overestimate down-regulated data. We demonstrate that none of the investigated housekeeping genes is suitable for normalization of the target gene RT-PCR data, but may be essential for tumor metabolism in human seminoma. Further, we developed a standardization strategy, which expressed by all cell types and do not vary under experimental conditions. Tissues of 9 normal testes and 22 classical tissues and 39 seminoma, including 1 normal testis and 17 seminoma of the RT-PCR group, were utilized for microarray is applicable to many experimental investigations. SARS corona virus, Yellow fever virus, Human Herpesvirus-6, Camelpox virus and Cytomegalovirus infections. Ten potential reference genes were compared for their use in experiments investigating cellular mRNA expression of virus infected cells. Human cell lines were infected with Cytomegalovirus, Human Herpesvirus-6, Camelpox virus, SARS coronavirus or Yellow fever virus. The expression levels of these genes and the viral replication were determined by real-time PCR. Genes were ranked by the BestKeeper tool, the GeNorm tool and by criteria we reported previously. Ranking lists of the genes tested were tool dependent. However, over all, β-actin is an unsuitable as reference gene, whereas TATA-Box binding protein and peptidyl-prolyl-isomerase A are stable reference genes for expression studies in virus infected cells. Background: Gene-expression analysis is increasingly important in biological research, with real-time reverse transcriptionPCR (RT-PCR) becoming the method of choice for high-throughput and accurate expression profiling of selected genes. Given the increased sensitivity, reproducibility and large dynamic range of this methodology, the requirements for a proper internal control gene for normalization have become increasingly stringent. Although housekeeping gene expression has been reported to vary considerably, no systematic survey has properly determined the errors related to the common practice of using only one control gene, nor presented an adequate way of working around this problem. Results: We outline a robust and innovative strategy to identify the most stably expressed control genes in a given set of tissues, and to determine the minimum number of genes required to calculate a reliable normalization factor. We have evaluated ten housekeeping genes from different abundance and functional classes in various human tissues, and demonstrated that the conventional use of a single gene for normalization leads to relatively large errors in a significant proportion of samples tested. The geometric mean of multiple carefully selected housekeeping genes was validated as an accurate normalization factor by analyzing publicly available microarray data. Conclusions: The normalization strategy presented here is a prerequisite for accurate RT-PCR expression profiling, which, among other things, opens up the possibility of studying the biological relevance of small expression differences. Eleven is a Python library for performing multi-gene RT-qPCR gene expression normalization. It is a free, open-source implementation of the GeNorm algorithm described by Vandesompele et al. in 2002. Documentation is hosted at Read the Docs. For accurate gene quantitation, it is essential to normalise real-time PCR data to a fixed reference; one that is not affected by your experimental conditions. There is increasing evidence that normalising to a single, randomly selected housekeeping gene e.g Actin Beta, introduces large and variable errors into the analysis. geNorm is a system for selecting the best candidate reference gene for each individual experimental scenario. PrimerDesign has acquired exclusive rights to develop and market geNorm based solutions. Each geNorm Kit provides a panel of housekeeping gene detection kits for use with the geNorm software (also provided). Sufficient reagents are included to perform up to 10 different geNorm analyses with a sample size of 10 (the minimum recommended). Following geNorm analysis we recommend using your results to select optimal normalising kits from our range of single or multiplex normalising gene kits. Genes for analysis in the geNorm kits are selected from a wide variety of cellular processes to ensure reference genes that are unaffected by your experimental conditions can be identified. Currently PrimerDesign has a large range of Human and Mouse reference genes for use with the geNorm software. If you are interested in using geNorm for another species or if you would like to add a candidate reference gene to our lists, then please contact us regarding this request. The geNorm software is available for free download for academic use only. Commercial entities may gain a limited licence when purchasing a kit from PrimerDesign. Alternatively, commercial entities may purchase a licence to use the geNorm software with their own assays. For all gene expression studies using quantitative PCR it is necessary to compensate for differences between samples due to material losses, differences in RT yields and PCR inhibition. Normalization should include an endogenous control gene, but can also be complemented by identical sample input amounts. The endogenous control gene should have constant expression in all the samples compared. There is no universal control gene, expressed at a constant level under all conditions and in all tissues. The best way to choose the proper reference gene is by running a panel of potential genes on a number of representative test samples. The gene(s) most appropriate for normalization are chosen in each case. The Human or Mouse Endogenous Control Panel consists of 12 validated qPCR assays for the most common endogenous control genes for gene expression studies, and provides a rapid and cost efficient way to identify your control genes. The panel is compatible with most commercial mastermixes containg SYBR Green 1. Why design 12 assays when 10 are not interesting for you ? One kit contains 100 rxns of 12 genes and is enough for several evaluations of appropriate reference genes. Soon available for several organisms. PATTYN, F., SPELEMAN, F., DE PAEPE A. & VANDESOMPELE, J. (2003). RTPrimerDB: the Real-Time PCR primer and probe database. Nucleic Acids Research, 31(1): 122-123. The real-time polymerase chain reaction (PCR) methodology has become increasingly popular for nucleic acids detection and/or quantiﬁcation. As primer/probe design and experimental evaluation is time-consuming, we developed a public database application for the storage and retrieval of validated real-time PCR primer and probe sequence records. The integrity and accuracy of the data are maintained by linking to and querying other reference databases. RTPrimerDB provides free public access through the Web to perform queries and submit user based information. Primer/probe records can be searched for by ofﬁcial gene symbol, nucleotide sequence, type of application, detection chemistry, LocusLink or Single Nucleotide Polymorphism (SNP) identiﬁer, and submitter’s name. Each record is directly linked to LocusLink, dbSNP and/or PubMed to retrieve additional information on the gene/SNP for which the primers/probes are designed. Currently, the database contains primer/probe records for human, mouse, rat, fruit ﬂy and zebraﬁsh, and all current detection chemistries such as intercalating dyes (SYBR Green I), hydrolysis probes (Taqman), adjacent hybridizations probes and molecular beacons. The choice of suitable reference genes is absolutely crucial in RT-qPCR gene expression analysis. Often, genes from commercial panels don't work well for one's own biological context. Ideally, the expression of reference genes should remain unchanged across samples within the context under study. If for a given condition there are not sufficient microarrays available in the Genevestigator database, extend your selection of microarrays to related or similar conditions. The Genevestigator database, which is queried by RefGenes, contains data from 14 species, such as human, mouse, rat, Arabidopsis, Drosophila, yeast, E. coli, and several crop plant species. See the Genevestigator content page for more details. RefGenes was presented at the 2011 qPCR Conference, Weihenstephan, Germany. Genevestigator is a high quality and manually curated expression database and meta-analysis system. It allows biologists to study the expression and regulation of genes in a broad variety of contexts by summarizing information from hundreds of microarray experiments into easily interpretable results. A user-friendly interface allows you to visualize gene expression in many different tissues, at multiple developmental stages, or in response to large sets of stimuli, diseases, drug treatments, or genetic modifications. This type of meta-analysis is core to understanding the spatio-temporal-response regulation of genes, to identify or validate biomarkers, and to find out which subnetworks are commonly affected in different diseases and conditions. Genevestigator transcriptome meta-analysis and biomarker search using rice and barley gene expression databases. Zimmermann P, Laule O, Schmitz J, Hruz T, Bleuler S, Gruissem W.
Genevestigator v3: a reference expression database for the meta-analysis of transcriptomes. Hruz T, Laule O, Szabo G, Wessendorp F, Bleuler S, Oertle L, Widmayer P, Gruissem W, Zimmermann P.
Web-based analysis of the mouse transcriptome using Genevestigator. Laule O, Hirsch-Hoffmann M, Hruz T, Gruissem W, Zimmermann P.
Statistical modeling for selecting housekeeper genes. There is a need for statistical methods to identify genes that have minimal variation in expression across a variety of experimental conditions. These 'housekeeper' genes are widely employed as controls for quantification of test genes using gel analysis and real-time RT-PCR. Using real-time quantitative RT-PCR, we analyzed 80 primary breast tumors for variation in expression of six putative housekeeper genes (MRPL19 (mitochondrial ribosomal protein L19), PSMC4 (proteasome (prosome, macropain) 26S subunit, ATPase, 4), SF3A1 (splicing factor 3a, subunit 1, 120 kDa), PUM1 (pumilio homolog 1 (Drosophila)), ACTB (actin, beta) and GAPD (glyceraldehyde-3-phosphate dehydrogenase)). We present appropriate models for selecting the best housekeepers to normalize quantitative data within a given tissue type (for example, breast cancer) and across different types of tissue samples. Selection of housekeeping genes for gene expression studies in human reticulocytes using real-time PCR. Silver N, Best S, Jiang J, Thein SL. BACKGROUND: Control genes, which are often referred to as housekeeping genes, are frequently used to normalise mRNA levels between different samples. However, the expression level of these genes may vary among tissues or cells and may change under certain circumstances. Thus, the selection of housekeeping genes is critical for gene expression studies. To address this issue, 7 candidate housekeeping genes including several commonly used ones were investigated in isolated human reticulocytes. For this, a simple DeltaCt approach was employed by comparing relative expression of 'pairs of genes' within each sample. On this basis, stability of the candidate housekeeping genes was ranked according to repeatability of the gene expression differences among 31 samples. RESULTS: Initial screening of the expression pattern demonstrated that 1 of the 7 genes was expressed at very low levels in reticulocytes and was excluded from further analysis. The range of expression stability of the other 6 genes was (from most stable to least stable): GAPDH (glyceraldehyde 3-phosphate dehydrogenase), SDHA (succinate dehydrogenase), HPRT1 (hypoxanthine phosphoribosyl transferase 1), HBS1L (HBS1-like protein) and AHSP (alpha haemoglobin stabilising protein), followed by B2M (beta-2-microglobulin). CONCLUSION: Using this simple approach, GAPDH was found to be the most suitable housekeeping gene for expression studies in reticulocytes while the commonly used B2M should be avoided. Mammalian gene expression is usually carried out at the level of mRNA where the amount of mRNA of interest is measured under different conditions such as growth and development. It is therefore important to use a bhousekeeping geneQ, that does not change in relative abundance during the experimental conditions, as a standard or internal control. However, recent data suggest that expression of some housekeeping genes may vary with the extent of cell proliferation, differentiation and under various experimental conditions. In this study, the expression of various housekeeping genes (18S rRNA [18S], glyceraldehydes-3-phosphate dehydrogenase [G3PDH], h-glucuronidase [BGLU], histone H4 [HH4], ribosomal protein L19 [RPL19] and cyclophilin [CY]) was investigated during fetal rat brain development using semi-quantitative RT-PCR at 16, 19 and 21 days gestation. It was found that all genes studied, with exception to G3PDH, did not show any change in their expression levels during development. G3PDH, on the other hand, showed increased expression with development. These results suggest that the choice of a housekeeping gene is critical to the interpretation of experimental results and should be modified according to the nature of the study. Accurate normalization is an absolute prerequisite for correct measurement of gene expression. For quantitative real-time reverse transcription-PCR (RT-PCR), the most commonly used normalization strategy involves standardization to a single constitutively expressed control gene. However, in recent years, it has become clear that no single gene is constitutively expressed in all cell types and under all experimental conditions, implying that the expression stability of the intended control gene has to be verified before each experiment. We outline a novel, innovative, and robust strategy to identify stably expressed genes among a set of candidate normalization genes. The strategy is rooted in a mathematical model of gene expression that enables estimation not only of the overall suitability of any normalization gene candidate in any kind of experimental design and should allow more reliable normalization of RT-PCR data. variation of the candidate normalization genes but also of the variation between sample subgroups of the sample set. Notably, the strategy provides a direct measure for the estimated expression variation, enabling the user to evaluate the systematic error introduced when using the gene. In a side-by-side comparison with a previously published strategy, our modelbased approach performed in a more robust manner and showed less sensitivity toward coregulation of the candidate normalization genes. We used the model-based strategy to identify genes suited to normalize quantitative RT-PCR data from colon cancer and bladder cancer. These genes are UBC, GAPD, and TPT1 for the colon and HSPCB, TEGT, and ATP5B for the bladder. NormFinder is an algorithm for identifying the optimal normalization gene among a set of candidates. NormFinder can analyze expression data obtained through any quantitative method e.g. real time RT-PCR and microarray based expression analysis. ”NormFinder.xla” is an Add-in for Microsoft Excel which adds the NormFinder functionality directly to the Excel software package for easy use. For documentation on the NormFinder algorithm and NormFinder Add-in see the NormFinder-HowTo and the article referenced below. Download the latest version of the NormFinder MS Excel Add-in or the version for "R" here. Dheda K, Huggett JF, Bustin SA, Johnson MA, Rook G, Zumla A.
Royal Free Medical School, London, UK. Biotechniques. 2004 37(1):112-4, 116, 118-119. Analysis of RNA expression using techniques like real-time PCR has traditionally used reference or housekeeping genes to control for error between samples. This practice is being questioned as it becomes increasingly clear that some housekeeping genes may vary considerably in certain biological samples. We used real-time reverse transcription PCR (RT-PCR) to assess the levels of 13 housekeeping genes expressed in peripheral blood mononuclear cell culture and whole blood from healthy individuals and those with tuberculosis. Housekeeping genes were selected from conventionally used ones and from genes reported to be invariant in human T cell culture. None of the commonly used housekeeping genes [e.g., glyceraldehyde-phosphate-dehydrogenase (GAPDH)] were found to be suitable as internal references, as they were highly variable (>30-fold maximal variability). Furthermore, genes previously found to be invariant in human T cell culture also showed large variation in RNA expression (>34-fold maximal variability). Genes that were invariant in blood were highly variable in peripheral blood mononuclear cell culture. Our data show that RNA specifying human acidic ribosomal protein was the most suitable housekeeping gene for normalizing mRNA levels in human pulmonary tuberculosis. Validations of housekeeping genes are highly specific for a particular experimental model and are a crucial component in assessing any new model. Real-time reverse transcription PCR (RT-PCR) is a sensitive and accurate method to monitor gene expression and is often used to profile the expression of putative tumor antigens in the context of immunotherapy. However, this technique consists of several steps, including cell processing, RNA extraction, RNA storage, assessment of RNA concentration, and cDNA synthesis prior to PCR. To compensate for potential variability introduced in this procedure, the expression of housekeeping genes is commonly assessed in parallel with the expression of the gene of interest. In this study, the expression of a variety of housekeeping genes in a panel of 26 different human tumor and embryonal cell lines was assessed using real-time RT-PCR. For some control genes, the variability in expression was significant between different cell lines, despite the equalization of quantities of input RNA. The greatest variability was found for GAPDH. The lowest variability was found for β-glucuronidase (GUS) and 18S rRNA. While real-time RT-PCR is a powerful tool for gene expression analysis, these results suggest that the choice of control genes to normalize the expression of the gene of interest is critical to the interpretation of experimental results and should be tailored to the nature of the study. Relative quantification is a powerful technique that is commonly used to study RNA gene expression. In relative quantification the expression of a target gene is measured with respect to a stably expressed reference gene (so-called housekeeping gene); the two gene levels are expressed as a ratio. The search for an ideal housekeeping gene can be cumbersome and time-consuming. However, housekeeping genes must meet certain criteria before they can be effective reference genes. This Technical Note gives specific guidelines for selecting housekeeping genes to be used as reference genes. It also recommends a basic procedure for setting up relative quantification applications. Note: For detailed information on performing relative quantification with the LightCycler System, see Roche Applied Science Technical Note No. LC 13/2001 (Relative Quantification). The LightCycler provides great flexibility especially to the user interested in quantitative PCR. With the use of relative quantification methods the result is expressed as a relative ratio of the target of interest, to a reference target measured in the same sample material. This Technical Note describes various approaches for relative quantification, gives information for the selection of suitable housekeeping genes, and offers some recommendations for PCR optimization to achieve successful quantification results with the LightCycler instrument. In addition the new LightCycler software for relative quantification is introduced and some mathematical background is provided for the calculation of efficiency corrected relative quantification values. Institute of Human Histology, University of Liege, Belgium. Quantitative studies are commonly realised in the biomedical research to compare RNA expression in different experimental or clinical conditions. These quantifications are performed through their comparison to the expression of the housekeeping gene transcripts like glyceraldehyde-3-phosphate dehydrogenase (G3PDH), albumin, actins, tubulins, cyclophilin, hypoxantine phsophoribosyltransferase (HRPT), L32. 28S, and 18S rRNAs are also used as internal standards. In this paper, it is recalled that the commonly used internal standards can quantitatively vary in response to various factors. Possible variations are illustrated using three experimental examples. Preferred types of internal standards are then proposed for each of these samples and thereafter the general procedure concerning the choice of an internal standard and the way to manage its uses are discussed. The stability of standard gene expression is an elementary prerequisite for internal standardisation of target gene expression data and many so called housekeeping genes with assumed stable expression can exhibit either upor down-regulation under some experimental conditions. The developed, and herein presented, software called BestKeeper determines the best suited standards, out of ten candidates, and combines them into an index. The index can be compared with further ten target genes to decide, whether they are differentially expressed under an applied treatment. All data processing is based on crossing points. The BestKeeper software tool was validated on four housekeeping genes and 10 members of the somatotropic axis differentially expressed in bovine corpora lutea total RNA. The BestKeeper application and necessary information about data processing and handling can be downloaded on here. Ribosomal 18S RNA prevails over glyceraldehyde-3-phosphate dehydrogenase and beta-actin genes as internal standard for quantitative comparison of mRNA levels in invasive and noninvasive human melanoma cell subpopulations. Goidin D, Mamessier A, Staquet MJ, Schmitt D, Berthier-Vergnes O.
INSERM U 346, affiliee CNRS, Edouard Herriot Hospital, Lyon, F-69437, France. performed duplex relative RT-PCR using ribosomal 18S RNA as internal standard including competimer technology. Statistical analyses provided significant evidence that invasive T1C3 melanoma cells exhibited a twofold higher mRNA level of both GAPDH and beta-actin than noninvasive 1C8 cells. This study demonstrates that the duplex relative RT-PCR procedure including ribosomal 18S RNA as internal standard and competimer technology is precise for RNA quantification and is tailored for cDNA array validation. Our data provide molecular evidence that cellular subpopulations of the same pathological origin are highly heterogeneous and extend the concept that the selection of an appropriate internal control for comparative mRNA analysis should be adapted to each model of human cancers. A compendium of gene expression in normal human tissues. Hsiao LL, Dangond F, Yoshida T, Hong R, Jensen RV, Misra J, Dillon W, Lee KF, Clark KE, Haverty P, Weng Z, Mutter GL, Frosch MP, Macdonald ME, Milford EL, Crum CP, Bueno R, Pratt RE, Mahadevappa M, Warrington JA, Stephanopoulos G, Stephanopoulos G, Gullans SR.
Renal Division, Department of Medicine, Center for Neurologic Diseases, Brigham and Women's Hospital, Harvard Medical School, Boston 02115, USA. Physiol Genomics. 2001 21;7(2): 97-104. This study creates a compendium of gene expression in normal human tissues suitable as a reference for defining basic organ systems biology. Using oligonucleotide microarrays, we analyze 59 samples representing 19 distinct tissue types. Of approximately 7,000 genes analyzed, 451 genes are expressed in all tissue types and designated as housekeeping genes. These genes display significant variation in expression levels among tissues and are sufficient for discerning tissue-specific expression signatures, indicative of fundamental differences in biochemical processes. In addition, subsets of tissue-selective genes are identified that define key biological processes characterizing each organ. This compendium highlights similarities and differences among organ systems and different individuals and also provides a publicly available resource (Human Gene Expression Index, the HuGE Index, http://www.hugeindex.org) for future studies of pathophysiology. Comparison of human adult and fetal expression and identification of 535 housekeeping/maintenance genes. Physiol Genomics 2: 143–147, 2000. Gene expression levels of about 7,000 genes were measured in 11 different human adult and fetal tissues using high-density oligonucleotide arrays to identify genes involved in cellular maintenance. The tissues share a set of 535 transcripts that are turned on early in fetal development and stay on throughout adulthood. Because our goal was to identify genes that are involved in maintaining cellular function in normal individuals, we minimized the effect of individual variation by screening mRNA pooled from many individuals. This information is useful for establishing average expression levels in normal individuals. Additionally, we identified transcripts uniquely expressed in each of the 11 tissues. profiling of T helper cell differentiation by quantitative real-time RT-PCR. Hamalainen HK, Tubman JC, Vikman S, Kyrola T, Ylikoski E, Warrington JA, Lahesmaa R.
results indicate that the expression level of a constitutively expressed gene may change during the cell culture in vitro, which emphasizes again the importance of carefully validating endogenous control genes for comparative quantification. validation by real-time, quantitative RT-PCR. The effects of serum on the expression of four commonly used housekeeping genes were examined in serum-stimulated fibroblasts in order to validate the internal control genes for a quantitative RT-PCR assay. NIH 3T3 fibroblasts transfected with an inducible chimeric gene were serum-starved for 24 h and then induced with 15% serum for 8 h. Serum did not alter the amount of total RNA that was expressed in the cells, however, the amount of mRNA significantly increased over time with serum-stimulation. Both messenger and total RNA from each of the time points were reverse transcribed under two different conditions; one in which the reactions were normalized to contain equal amounts of RNA and another series of reactions that were not normalized to RNA content. The resulting cDNA was amplified by real-time, quantitative PCR using gene-specific primers for beta-actin, beta-2 microglobulin, glyceraldehyde-3-phosphate dehydrogenase (GAPDH) and 18S ribosomal RNA. The expression of beta-actin and GAPDH increased up to nine- and three-fold, respectively, under all conditions of reverse ranscription (P<0.01). The expression of 18S rRNA increased with serum-stimulation when the cDNA synthesized from non-normalized, total RNA was assayed (P<0. 01) but not when the reverse transcriptions were normalized to RNA content (P>0.05). The expression of beta-2 microglobulin increased up to two-fold when assayed from cDNA synthesized from non-normalized mRNA, but was unaffected by serum when the reverse transcriptions were normalized to mRNA. beta-2 Microglobulin expression was found to be directly proportional to the amount of mRNA that was present in non-normalized reverse transcription reactions. Thus, beta-2 microglobulin and 18S rRNA are suitable internal control genes in quantitative serum-stimulation studies, while beta-actin and GAPDH are not. The internal control gene needs to be properly validated when designing quantitative gene expression studies. deaminase mRNA and their comparison as control transcripts for RT-PCR. Lupberger J, Kreuzer KA, Baskaynak G, Peters UR, le Coutre P, Schmidt CA. Virchow-Klinikum, Humboldt University Berlin, FRG. Quantitation of target mRNAs using the reverse-transcription polymerase chain reaction found a widespread field of application in diverse biomedical diagnostic assays. However, the problem of varying sample quality has to be solved by correcting target molecule amounts through detection of an endogenous control template. The choice of an appropriate reference gene is still object of debate as pseudogene co-amplification and expression level variations may limit the usefulness of some currently used reference reactions. We compared quantitative expression levels of the commonly used endogenous reference genes beta-actin (beta-actin), beta-2-microglobulin (beta2-MG) and porphobilinogen deaminase (PBDG) using the TaqMan chemistry. With these assays we investigated the respective expression patterns in K562 cells and leucocytes of normal individuals as well as of malignoma patients. In K562 cells 1544+246 beta-actin, 65+30 beta2-MG and 22+/-8 PBDG copies/cell were detected. In normal leucocytes 491+/-97 beta-actin, 40+/-17 beta2-MG and <1 PBDG copies/cell were quantified. Leucocytes of various malignancies exhibited 84+/-51 beta-actin, 106+/-8 beta2-MG and <1 PBDG copies/cell. We conclude that beta2-MG is the most suitable reference gene tested as its variation between different sample origins and within distinct cell types was acceptable low. Selection of optimal internal controls for gene expression profiling of liver disease. Recently developed technologies such as microarray analysis allow researchers to determine the genome-wide patterns of expressed genes. This information provides insight into complex regulatory networks, enables the identification of new or underexplored biological processes, and implicates genes in various disease processes (1). While microarray analysis provides genome-wide information on relative gene expression, real-time reverse transcription-PCR (RT-PCR) provides quantitative information by the simultaneous measurement of gene expression in many different samples, which makes the technique especially suitable for research questions that require the measurement of expression level changes (2). Compared to conventional quantification methods such as Northern blot analysis, RNase protection assay, or competitive RTPCR, real-time RT-PCR analysis has the advantages of greater speed, higher throughput, and a higher degree of potential automation (3,4). Nevertheless, all strategies for mRNA quantification require accurate, reproducible normalization. For the correct normalization of gene expression analysis, various strategies have been applied, such as counting cells, total RNA quantitation, and rRNA measurement (3). However, internal control genes are most frequently used to normalize mRNA expression in laboratory experiments. The internal control, usually one of the so-called housekeeping genes (5), should not vary between the tissues or cells under investigation or in response to experimental treatment. However, although housekeeping genes are constant in certain cell types, they can vary in other types (6,7), particularly in clinical samples associated with malignant diseases (5). Thus, the selection of proper control genes for clinical patient samples is vital to gene expression analysis. studies of Pseudomonas aeruginosa by real-time quantitative RT-PCR. Constantly expressed genes are used as internal controls in relative quantification studies. Suitable internal controls for such studies have not yet been defined for Pseudomonas aeruginosa. In this study, the genesampC, fabD, proC, pbp-2, rpoD and rpoS of P. aeruginosa were compared in terms of expression stability by real-time quantitative RT-PCR. A total of 23 strains with diverse resistance phenotypes were studied. Stability of expression among the housekeeping genes was assessed on the basis of correlation coefficients, with the best-correlated pair accepted as being the most stable one. Eventually, proC and rpoD formed the most stable pair (r ¼ 0·958; P , 0·001). Next, in four ciprofloxacin-selected nfxC-like mutants, levels of oprD, oprM and oprNmRNA were compared with those of their wild-type counterparts. The comparison was made after correcting the raw values by the geometric mean of the internal control genes proC and rpoD. The level of oprN mRNA was significantly up-regulated, while the oprD gene was down-regulated (although this difference was statistically insignificant), in the mutants. This expression pattern was consistent with that of the expected expression profile of nfxC-type mutants; this experiment therefore lends further support to the use of proC and rpoD genes simultaneously as internal controls for such studies. in microdissected human renal biopsies. Using a single housekeeper gene as reference for renal biopsy studies, differences in gene expression ratios may reflect regulation of the internal control rather than the mRNA under investigation. Relating the gene expression to several housekeepers in parallel (i.e., 18S rRNA and cyclophilin A) should result in robust expression data. normalization to rRNA or single housekeeping genes is inappropriate for human tissue biopsies. Careful normalization is essential when using quantitative reverse transcription polymerase chain reaction assays to compare mRNA levels between biopsies from diﬀerent individuals or cells undergoing diﬀerent treatment. Generally this involves the use of internal controls, such as mRNA speciﬁed by a housekeeping gene, ribosomal RNA (rRNA), or accurately quantitated total RNA. The aim of this study was to compare these methods and determine which one can provide the most accurate and biologically relevant quantitative results. Our results show signiﬁcant variation in the expression levels of 10 commonly used housekeeping genes and 18SrRNA, both between individuals and between biopsies taken from the same patient. Furthermore, in 23 breast cancers samples mRNA and protein levels of a regulated gene, vascular endothelial growth factor (VEGF), correlated only when normalized to total RNA, as did microvessel density. Finally, mRNA levels of VEGF and the most popular housekeeping gene, glyceraldehyde-phosphate dehydrogenase (GAPDH), were signiﬁcantly correlated in the colon. Our results suggest that the use of internal standards comprising single housekeeping genes or rRNA is inappropriate for studies involving tissue biopsies.